Planning on attending a medical school in Pennsylvania? You may be in the pool of tens of thousands of other applicants this cycle. In the 2016-2017 cycle alone, Pennsylvania was reported to have four of the top ten medical school application received in the United States. For instance, Lake Erie College of Osteopathic Medicine received 16,187 applications in the 2016-2017 cycle, most out of any medical school in the United States. Similarly, Pennsylvania had three other medical schools in the top ten for the volume of applications received. These include Drexel University College of Medicine, Sidney Kimmel Medical College at Thomas Jefferson University, and Lewis Katz School of Medicine at Temple University. Does it mean that your chances of getting in a medical school in Pennsylvania are extremely low? Not exactly. Although the state reviews four of the most applications in the United States, Lake Erie College of Osteopathic Medicine, for example, has an acceptance rate of 7.6% which is greater than most medical schools across the United States reported by US News and World Report. Furthermore, one of the top-ranked schools in the country, Perelman School of Medicine at the University of Pennsylvania ranked 6th in research while University of Pittsburgh School of Medicine ranked 14th. It is no coincidence that top-ranked medical schools in the country, especially those in Pennsylvania accept students who have research experience. Interested in learning how to make yourself more competitive for medical acceptance? Sign up for a FREE consultation now. Before we analyze the statistics of each school, lets list all of the medical schools in Pennsylvania. 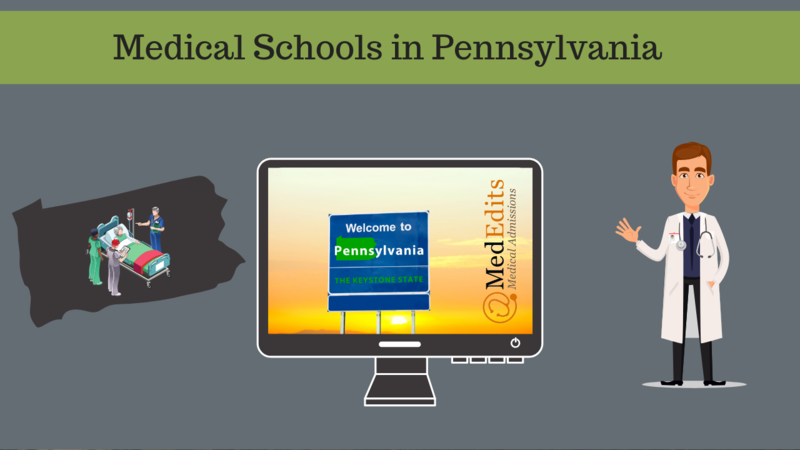 How Can You Standout in Medical School Admissions in Pennsylvania? Besides a competitive GPA and MCAT score, Pennsylvania schools look for research and clinical experience. Two of the top-ranked schools are also ranked in the top fifteen in research across the country. Therefore, it is wise to analyze the statistics of each school and knowing what extracurriculars they look for before applying. It is also crucial to take note of in-state and out-of-state matriculants in Pennsylvania. Because Pennsylvania receives a high volume of applications each year, most of the applications received by Pennsylvania’s medical schools are out-of-state, nearly 90% compared to the 10% of in-state applicants. Subsequently, the percentages of in-state matriculants increase nearly three folds compared to 60% out-of-state matriculants. To measure how competitive it is to get into a medical school in Pennsylvania, lets investigate the numerical data for each medical school, below are the averages of MCAT scores, GPAs, interview rates of in-state and out-of-state applicants, acceptance rates, matriculants of in-state and out-of-state, and cost of tuition for each medical school. Related Video: Do I need clinical experience to get into medical school? With a high volume of applicants, how can you stand out to the admissions committee of medical schools in Pennsylvania? What are some variables that can increase your chances of being admitted to these schools? Committing to only a few schools that fit your mission and statistics may not be enough to get you through the admissions process. It is crucial that you focus on meeting the requirements for each school and making sure that GPAs and MCAT scores are consistent with the averages of each medical school. If the GPA and MCAT scores are lower than the average for each school, it is wise to consider retaking the exam and showing score improvement from the last. Similarly, if your GPA is lower than average, you may consider completing a post-bacc program or enrolling in a Masters program. Showing a positive trend in GPA allows you to show the admissions committee that you are capable of handling difficult courses and excelling in them. This is also a great way to gain research experience in these programs as many schools in Pennsylvania look for these types of factors when applying. What is the purpose of secondary applications? These supplemental applications play a crucial role in determining how well you fit the school’s mission through your character. It is a great way to show the admissions committee who you are as a person besides your GPA and MCAT score. Knowing why you want to apply to a certain school, is it because you’ve enjoyed doing research in a lab? Enjoyed working with patients in a hospital? All of these variables help the schools in Pennsylvania determine who gets interview invites from a large pool of applicants after a holistic review of your application. It is also important to consider how well you’re ready for medical school. Factors which play into “readiness” aren’t only GPA and MCAT scores, but also maturity and personal growth. Those who’ve been able to apply with competitive scores while successfully working, doing research, shadowing and running clubs/organizations have time management skills and strong work ethic, which all transfer over to the “readiness” each medical school looks for. Knowing how these qualities play an important role is crucial in determining your ability to become a physician. By proving to the admissions committee during the secondary’s and interviews that you’re capable of handling difficult coursework while working with patients and rotating in hospitals, that you’re more than a competitive applicant with excellent GPA and MCAT scores. Knowing what each medical school in Pennsylvania looks for and showing them why it personally matters to you can increase your chances of being admitted.